In two separate announcements this week FLOW Science announced the formation of a joint venture in Germany and the call for papers for their upcoming user conference. Flow Science Deutschland GmbH was formed in partnership with personnel from CFD Consultants, Flow Science’s former distributor for Germany, Austria, and Switzerland. This new entity is said to be an important milestone for Flow Science’s growth in the region. Flow Science opened the call for papers for their 2012 FLOW-3D World Users Conference to be held this coming September in San Francisco. They are seeking both technical presentations and entries for the poster session. A computational science forum is now in beta use at Stack Exchange, an online network of communities for sharing information about specific topics. Current CFD-related topics run the gamut from recommendations for fast matrix solvers to getting started with OpenFOAM and more. The OpenFOAM Foundation released OpenFOAM v2.1.1. This update is said to “consolidate” the recent 2.1.0 release including bug fixes and enhancements. CEI Software announced the release of EnSight 10.0.2d, a minor bug-fix update. Beta CAE Systems announced the latest release of their CAE post-processor, μEta v6.8.1. Exa released PowerDELTA 1.6, the preprocessor for their PowerTHERM thermal analysis suite. Mentor Graphics announced the availability of FloEFD v11.3 for PTC’s design software. ICON FOAMpro 2.1.1 will include new species transport solvers and accompanying models. Because of an issue with the conference hotel, the Open Source International Conference will now be held 29-30 October 2012 in London. 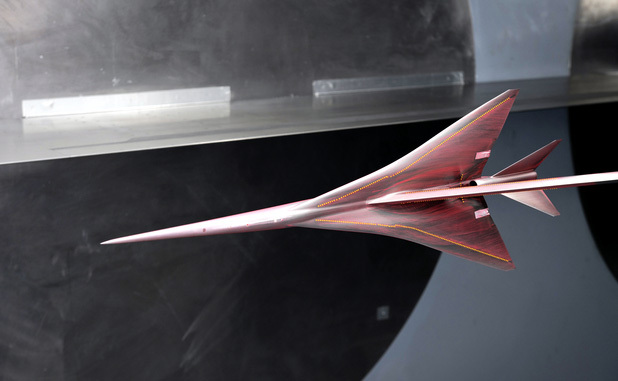 This is a model of a Lockheed Martin design of a supersonic transport in the wind tunnel. Image from Aviation Week. Improvements in CFD helped achieve low sonic boom and low drag which may lead to supersonic transport aircraft that can overfly the continental U.S.
Windpower Engineering & Development provides this overview of trends in simulation software including CFD. The University of Wyoming’s Prof. Dimitri Mavriplis will be one of the first and biggest users of the Wyoming Supercomputing Center for CFD. F*** Yeah Fluid Dynamics continues to post incredibly interesting videos of fluid phenomena. Designer Giles Miller created a unique, pixelated entrance archway for the UK’s Clerkenwell Design Week by creating what appears to be a polygonal mesh created from over 20,000 laser-cut wooden hexagons. Even though the mesh cells are uniform throughout, they’re set at different angles so that relative lighting creates patterns. Many more photos of the work are available at the link. The entrance archway to Clerkenwell Design Week has a pixelated effect from over 20,000 wooden hexagons. This entry was posted in Applications, Events, News, Software and tagged Beta CAE, CEI, EnSight, Exa, FloEFD, Flow Science, FLOW-3D, FOAMpro, Mentor Graphics, OpenFOAM. Bookmark the permalink. Keep rocking the great content. I just pin’d it. Thanks.